It’s been speculated about and weirdly sort-of confirmed before, but tonight, we got a little more details. 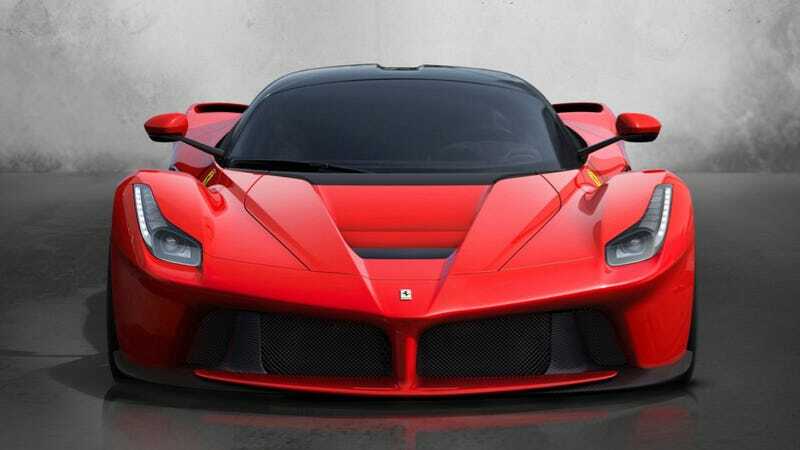 A roofless LaFerrari Spider is happening, and Ferrari is making 150 of them. The other important detail we learned was that customers ordered their cars about three months ago, and that’s all you really need to know about the convertible LaFerrari right now. But there’s more weirdness to it. I can’t believe I’m typing this, but this is possibly one of the most deeply strange ways I’ve ever seen a car announced before. So, TOP GEAR SPOILERS BELOW. You have been warned. Gordon Ramsay (??) and Jesse Eisenberg (???) appeared together (????????????) as the first Stars In A Rallycross Car, and in the sort of meandering discussion new host Chris Evans—with all the subtlety of a LaFerrari smashing straight onto your face—asked Ramsay about his own LaFerrari. Ramsay, naturally, first replied with a story about picking up his daughter in it. And then Evans quite obviously asked him about “another, future best car” he’d be getting shortly. Which is not true, at least if you ask the actual Chairman of Ferrari, who in an interview with Automobile called the LaFerrari Spider “no secret.” But that may not have been true whenever this studio interview was shot. After that, the episode mostly carried on. But put on your tinfoil hats, because this is where it gets fun. I do have a genuinely hard time believing that Top Gear and Ferrari didn’t coordinate this announcement at all. Ferrari is notorious for tightly controlling its media message, as one of Top Gear’s own hosts well knows. At the same time, Chris Evans is famous in the car world for his Ferrari collection, and Ramsay had to be invited to purchase the LaFerrari Spider before it was even public. To say that they have close connections to Ferrari, the company, would be an understatement. Those two things together seem to imply that Top Gear is now an active and willing participant in the advertising strategy of Ferrari, a car company. And in a job where you’re supposed to be honestly critiquing products, that is Frowned Upon. Is this the way Top Gear’s headed in the future? If so, it’d be a massive departure from past practice. Was the announcement actually officially sanctioned by Ferrari? If not, has Ramsay’s Ferrari now been cancelled? Ferrari declined to comment when we reached out. The BBC has not yet responded to a request for comment.